At least 20 people have been killed in explosions after an accident at an army base in Tanzania's commercial capital, Dar es Salaam, officials say. The multiple blasts from various arms depots lasted several hours at the Gongola Mboto military base. The nearby international airport has been closed and road to it blocked off. Thousands of residents living near the military base have fled the area, many congregating at the National Stadium in the city centre. Many houses in Majohe, the residential suburb by Gongola Mboto military base, have been burnt to ashes. A shopkeeper in Majohe told the BBC the explosions began at 2000 local time. He said he immediately took his family to stay with other relatives and returned later in the evening as he feared there may be looting. But by the time he got back there was nothing to save as both his shop and house had been destroyed. Smoke still hangs over the area and residents are continuing to flee because they say they did not trust the authorities' assurances that further blasts will not occur. Military inspection teams can be seen driving around the streets looking for discarded arms. In order to stop the panic overnight, the police sent out a text message urging people to remain calm. On Thursday morning, mobile phone subscribers received another message advising those who had lost relatives while fleeing to congregate at the National Stadium near the city centre to find them. Debris was hurled across the city and army chief of staff Gen Abdurahman Shimbo said 20 people had died, most of them residents in neighbouring areas. Earlier he had said 32 people had died. Prime Minister Mizengo Pinda said the explosions had started in one arms depot before spreading to others in the camp. Army spokesman Lt Col Kapambala Mgawe told AP news agency that the explosions were accidental. Residents were encouraged to stay inside their homes and away from windows after the blasts. 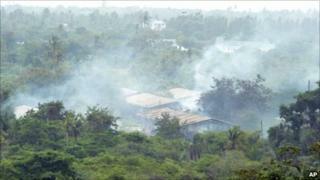 By Thursday morning, 23 munitions depots had been destroyed, along with some residential houses and a secondary school. Correspondents say the explosions caused panic among city residents overnight because there was no clear information about what was happening at first. "My neighbour's house was struck by debris from a rocket-propelled grenade. Luckily, no-one was injured because we were told to evacuate our homes," resident Hassan Kondo told Reuters news agency. Mr Pinda told the National Assembly that at least 4,000 people were sheltering at the National Stadium, and warned the death toll could increase. "We are asking the residents around that area, if they see or come across a bomb not to touch it but inform us," Gen Shimbo told the BBC. He said it was yet not known what exactly had triggered the blasts, but the incident came as a surprise as the warehouses had been inspected three days ago and all had been well. The BBC's Ben Mwang'onda in Dar es Salaam says the police are urging people to stop fleeing from the area. Police say rumours that there will be further explosions are being spread by potential looters, he reports. The British Foreign Office said police had set up an evacuation centre accepting those within a 10km (six miles) radius of the explosion site. Officials say more than 100 people have been wounded in the explosions and President Jakaya Kikwete has visited survivors at Amana hospital in Dar es Salaam. Explosions at an ammunition depot at Mbagala army base near Dar es Salaam in the spring of 2009 killed more than 20 people, including five army officers.